I had good intentions of surfing the net last night when I got home from the ball fields and discovering some great fancy finds for this Fancy Friday post but I was hit with an annoying case of the dizzies, which I get periodically, thanks to the wonderful world of allergies, and just could not, as hard as I tried, get my swirling, twirling mind to focus on this screen. So instead, I stayed up until nearly midnight watching Private Practice and Grey's Anatomy, that I had recorded while I was living it up at little league. Baseball kinda rules my life right now. That and dogs and birds but we won't go there again today. I did think about skipping the fancy altogether today but I could not let my faithful readers down...all 5, okay maybe 3, of you. 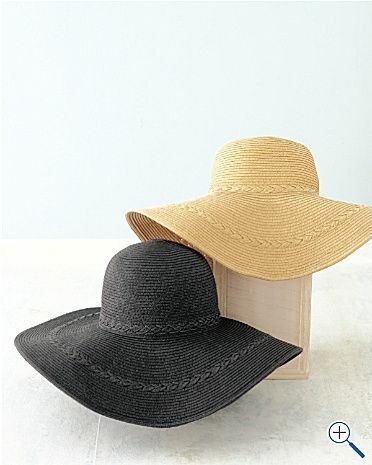 Since summer is , I think, now here to stay for awhile, I thought I'd focus on fancy sun hats and flip flops because, number 1, y'all know about my little thing for hats and 2, who doesn't love a cute pair of flip flops in the summer. 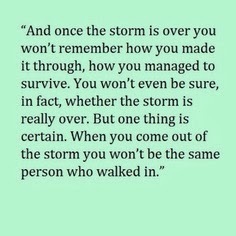 At the beginning of last year, I got concerned about a spot on my chest so I made an appointment for the dermatologist and turns out, it was a basal cell carcinoma, a type of skin cancer which I went through 6 weeks of treatment for and let me tell you, I don't care to go down that path again cause it was just no fun. And while it was not a serious type of skin cancer, it was still the C word and enough to scare me away from tanning for the rest of my life. The dermatologist gave me a lecture about the importance of sunscreen and directed me to the Wallaroo Hat Company from Australia. 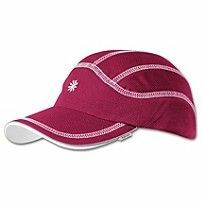 I ordered two hats and I love them both but my favorite is this Sydney Diva hat with its UPF 50+ sun protection. 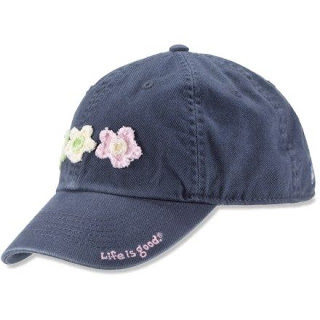 And the other is this sweet little Casual Traveler canvas hat that comes in several cute colors. It also has the UPF 50 + protection. This pic of me wearing mine was taken in Spain last summer as my two girlfriends, Jenn and Michele, were chillin' by the Mediterranean. I think this was taken just before the 18 year old senorita supermodel chick showed up, spread her towel out about 50 feet away from us and then proceeded to take off her top, rub herself down with oil and sunbathe in front of us for the rest of the day. The poor girl was clueless how close she came to death that day. Our friend, Paul, took about five hundred and eighty five pics of her that she was also clueless about, and that he will most likely cherish for the rest of his life. 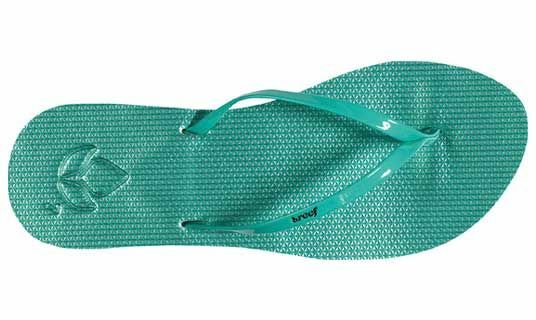 I saw these Havana flip flops at Belk last week but I showed self restraint by not buying a pair. I'm still, however, coveting them online. They felt really good when I tried them on too. They come in a few colors. I tried the navy ones on. 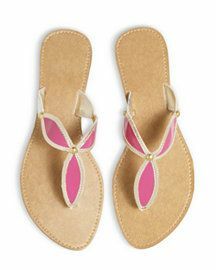 Or check out this fancy little pink pair I found at Newport News and on sale for $14. 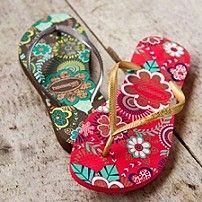 I don't know how comfortable they'd be, but they do have fancy and cute going for them, two words I am well aware how much I overuse every Friday but hey, it's my blog and I'll overuse if I want to. I found this one at Athleta and it also comes in black and white. I found this Life is Good one at REI. 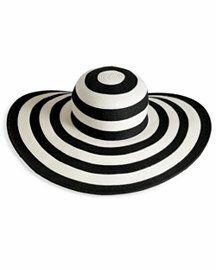 I found several fancy sun hats at Zappos but this one by Juicy Couture was my favorite. This black and white one is from Newport News though I think it's one of those that you'd just have to try on cause I'm not sure just anyone, me included, could pull this off. Or how about this raffia one in black or natural from Garnet Hill. 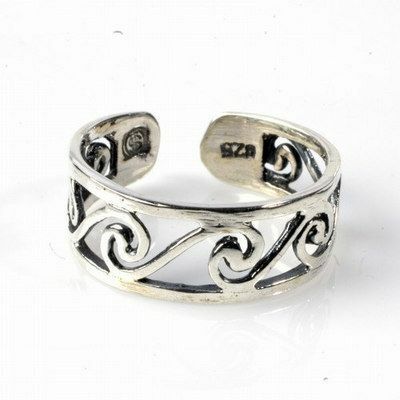 I have yet to order anything from this site but they have some really classy things here. 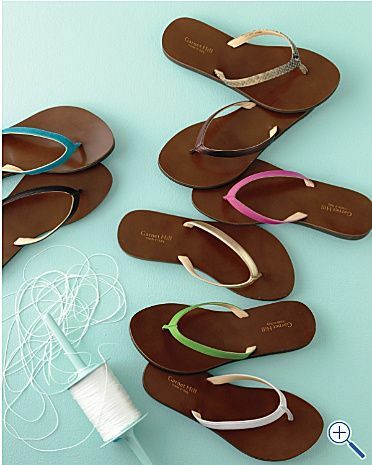 Like these cute Roma leather sandals in 8 different colors that I also found there. I also spotted several cute pairs at Reef. Here are a couple but there were so many, you should just click on the link and check them all out for yourself. I love both of these but it would really make me happy to see the first pair in the turquoise color of the second pair. And that is all I have in hats and footwear for y'all on this Fancy Friday but nothing can fancy up a summer flip flopped foot better than a cute (yes, I said it again) toe ring. I love my yellow box flip flops. 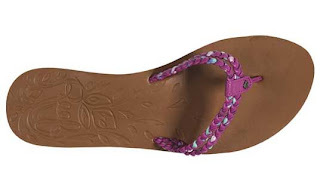 The thicker ones are what I'm wearing right now because I broke a bone in my foot and I need the height on my right foot to match the height from the "moon boot" on my left foot! 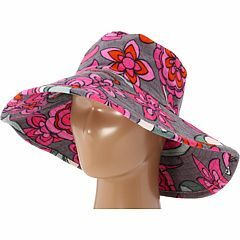 I got a stylish "prana" hat for mother's day. It's sporty. It will be nice since I cut 10 inches off my hair, today. Locks of Love is a good thing!